The Monadnock® brand has been synonymous with quality as the leading supplier of batons, restraints and training aids, and the preferred choice of law enforcement professionals the world over for more than 50 years. Currently under the Safariland umbrella, Monadnock brings their collective heritage and expertise to focus on their primary objective, providing the highest quality and most innovative products to the men and women who depend on them everyday. 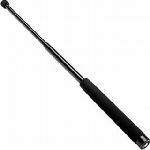 More law enforcement officers choose to carry American-made Monadnock® batons over other competing brands. There is a reason. We build it better.